Most of the scaffolding has now been taken down from the new block at Teddington and you can see how fine the building will look. Work has begun on the entrance foyer connecting the Admin, and Studio blocks, while the rehearsal rooms are beginning to look complete. 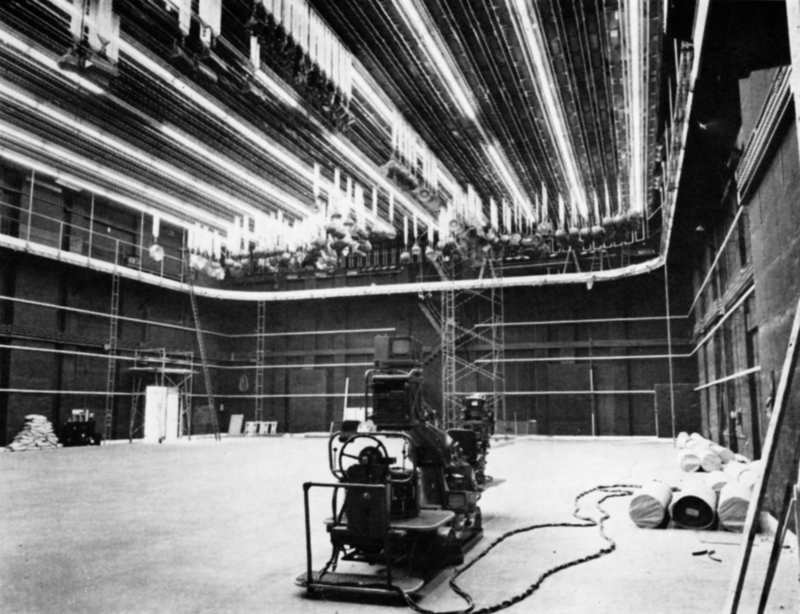 Already a large amount of cable has been laid and units are being fixed into the racks in Central Apparatus Room – the whole place is full of wiremen crawling around the void under the ‘waffle floor’ or running cables into the studio trunking. Painters have got the undercoat finishes on the walls and the control desks have had their woodwork polished ready for a final finish when installation is completed. Checking the floor of Studio 1 for flatness with a camera lined up on the black and white pole at the far end of the studio. Camera tests have been made on the studio floor and the odd humps and hollows smoothed out before the lino is laid. The working area of Studio One is over 7,000 sq. feet – so the lino laying is no small job. To give the best possible chance of keeping a flat floor, any high spots on the concrete screed were ground down, then the asphalt laid with extreme care, being continuously checked by level, and straightedge – and finally by running a camera on a crane over the floor and watching the output on a line strobe monitor (a sort of electronic straightedge!). Now that the main building work is practically finished, many smaller jobs are being tackled, and Make-up and Wardrobe have both been invaded by bricklayers, carpenters, glaziers and the like. It makes a change from actors – and what is more, before long it will be possible to walk under cover from these departments to any studio – which will make a change for actors! In spite of what you might think in Manchester, Teddington is not always bathed in Mediterranean sunshine. 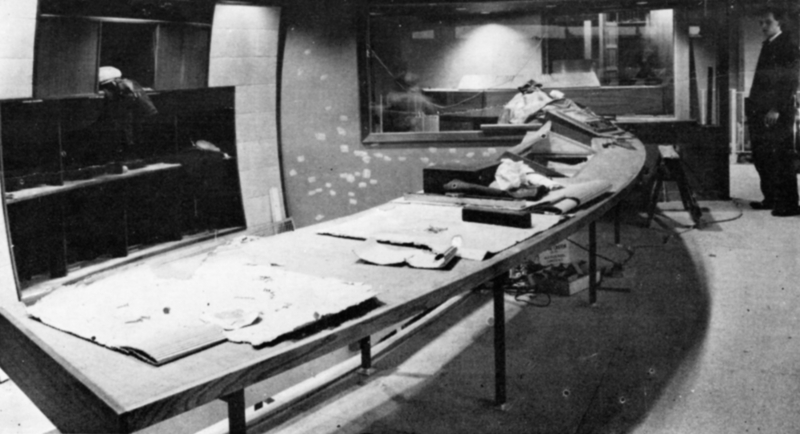 Studio 1 Production Control Room as it looked before the equipment was installed. Sound Control is through the window in the background and the studio itself is off to the right, behind the Director. Studio 2 Vision Control Room is similar to that for Studio 1 but has a window into C.A.R. Studio 1 has priority so the lighting console shown here is just a mock-up in hardboard. The Planning and Installation boys are kept pretty busy making sure all the bits of equipment go together, and feeding information to Marryat and Place’s wiremen. Three Cintel Telecine machines and an R.C.A. recorder have been negotiated up the goods-lift (with fractions of an inch clearance in one case) and should be working in advance of the studio equipment. Then comes the job of transferring Master Control and C.A.R., which is going to be a great day indeed. Meanwhile, it all looks very exciting and those visitors who are allowed to penetrate into the first floor are obviously highly impressed. There seems little doubt that Teddington No. 1 will soon be a first-class studio able to stand comparison with anything elsewhere in the country (or in the world for that matter) and will set the pattern for future ABC studios.